Both instances of RPC-600, at site of recovery. Containment Protocols: Both instances of RPC-600 are to be contained in a standard Alpha-class object container at Site-█, accessible by any Level 3 or higher personnel only during approved testing (See Addendum 600-1). Testing involving RPC-600 must be seen and approved by 2 level 4 clearance personnel or the Site Director beforehand. In the event of a containment breach, the re-containment of RPC-600-1 and 2 are considered a top priority due to their effects. 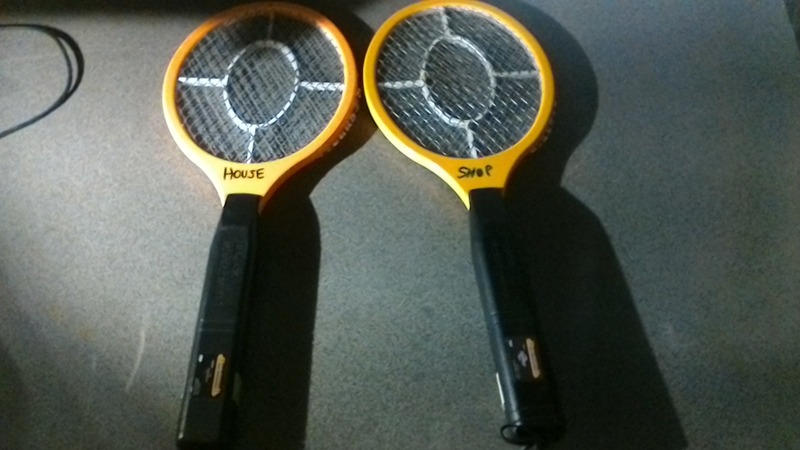 Description: RPC-600 is the designation for two ██████ brand electric mosquito rackets (RPC-600-1 and RPC-600-2 respectively). The make and model are for all intents and purposes identical to a normal mosquito racket of the ██████ brand, with the exception that RPC-600 appears to be immune to extreme temperatures. The anomalous properties of both instances of RPC-600 are identical and have thus far not shown any deviations in behavior. RPC-600’s anomalous properties surface when its racket area makes physical contact with the limb1 of a living subject (See Addendum) while in a powered on state. Upon making contact with said limb, both become bonded and cannot be separated, as the limb begins to heat to ███ degrees █. During this period, the limb will glow before completely disintegrating2. Other parts of the body are not affected by the heat up until this point, often setting subjects on fire via their connections to the limb. Addendum 600-1: On ██/██/20██, the right wing of Site-█ used for the containment of Alpha-class objects was completely disintegrated during testing with RPC-600. ███ casualties from the resulting fire were sustained during the event, along with the confirmed loss of ██ RPC objects, with █ currently unaccounted for. Cause of the event was found to be RPC-600-2 making contact with the floor of the testing chamber during testing. Both objects have been found and re-contained █ hours after the event. Containment procedures subsequently updated. “Okay, now, we're still reeling in our understanding on what this thing is following that incident with it. While it's currently banned from testing, Dr. Bloom and I have been coming up with hypotheses. Addendum 600-2: Following the reception of information from Assistant Jocyln, containment procedures have been upgraded for RPC-600 as it has been theorized that contact with a vacuum (particularly the vacuum of space) in a powered state would cause an end of the world scenario along with destruction of the rest of [REDACTED]. 1. What the object defines as a ‘limb’ appears to be a protrusion of significant size. 2. It should be noted that no trace of the heated matter is left behind following this process.